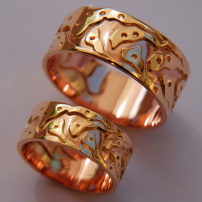 Type: Ojibwe-style graphic overlay wedding ring, organic (sculptural) finishing by means of melting and hammer-texturing. 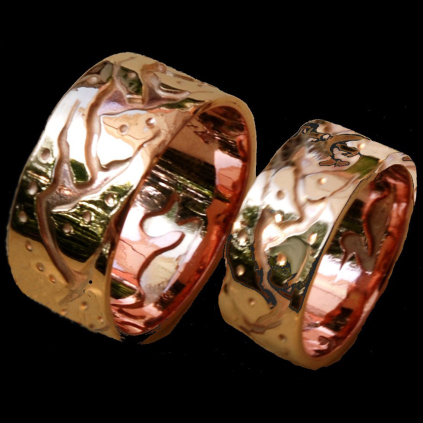 Woodland Art jeweler Zhaawano executed the above bicolor gold Midewiwin Life Road wedding bands with the aid of his trademark method of Ojibwe graphic overlay and provided them with an organic look - characterized by a slightly melted ("sculptural") top layer with a subtle hammer blow-structure surface. The rings, which consist of a 14K warm yellow gold exterior and a 14K red gold interior, show a cut-out symbol of the Midewiwin Life Road with a cut-out, stylized design of Maang (a loon) on the insides. To Zhaawano's ancestors, Maang, the skilfull waterbird with the loud, wild cry, symbolized conjugal fidelity, for it was the close companionship between loons that best reflected wiidigendiwin, the union between husband and wife. 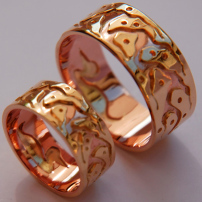 The title of the wedding rings, Niwiijiiwaa Waawaashkamiinaang, literally means: I accompany him/her on the crooked road. To learn more about the symbolic meaning of the Midewiwin Life Road symbol, see Zhaawano's Artblog.